2015 certainly was the year of the halal gourmet burger joint. There seemed to be one cropping up on every corner, but let’s be honest, I for one am definitely not complaining. In fact I’ve made it my mission to visit them all at some point this year and as expected, I’m headed to a good start because this week I took a little trip to North London to visit Band of Burgers. 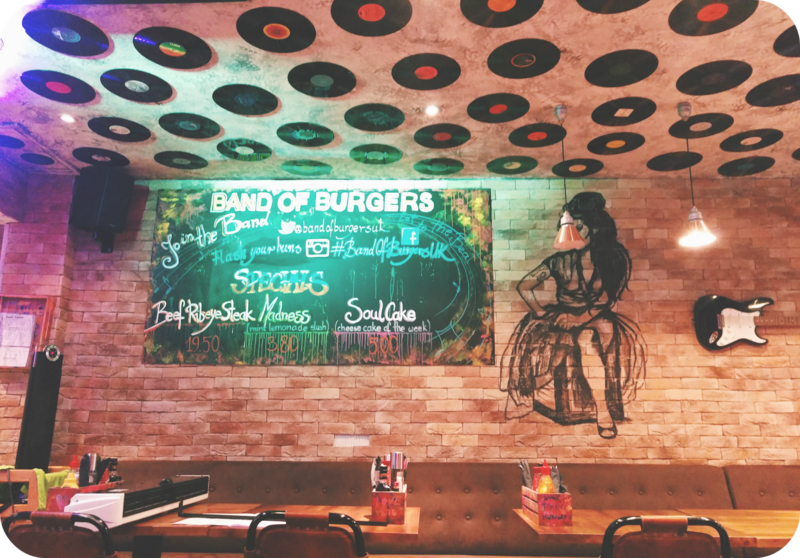 Literally a stone’s throw away from Mornington Crescent station, Band Of Burgers sits on a busy high street alongside other restaurants and take-aways. It easily looks the most intriguing and I couldn’t wait to get in. Mostly because it was pouring down with rain, but also because, you know, food. The decor inside is right up my street and as soon as I saw the stencill graffiti art of Amy Winehouse on the wall, I knew I was going to love it here. Having arrived for a late lunch on a weekday, we were literally the only customers there. We were seated really quickly and since we had a laptop with us, the waitress very kindly put together two tables for us, without us even having to ask. As always the first thing I noticed was the abundance of condiments already on the table. Everything you could possibly want was there including mustard & vinegar. Things were looking good! 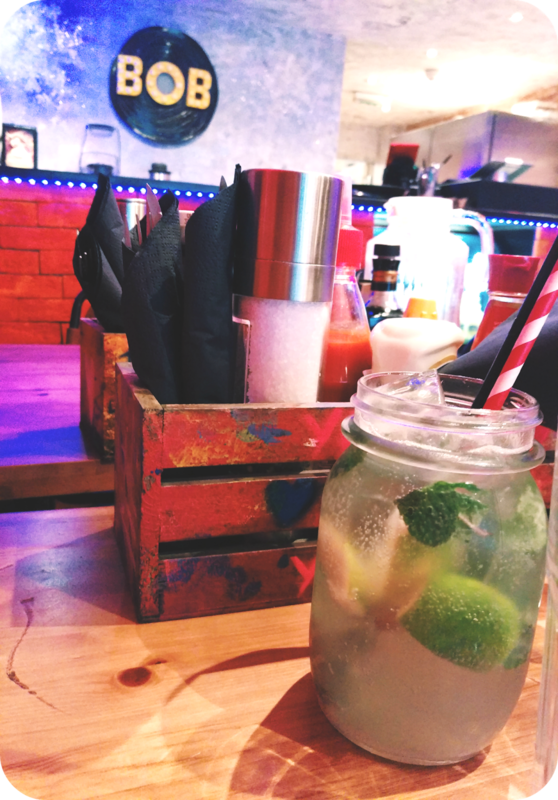 The menu is pretty extensive compared to other gourmet burger places and I love the option to create your own burger for those of you who are fussy eaters like me. I did think about it but in the end we decided to opt for the Voodoo Chilli and The Mexican burger accompanied by sweet potato fries and rosemary and thyme chips. We were given the option to pick how we wanted the beef to be cooked and I opted for well done. I don’t like my meat pink or bloody so it seemed a safe bet. I went for my usual virgin mojito and hoped that they made it properly. The food came really quickly (again, we were the only customers so I should hope so!) and the presentation was brilliant. 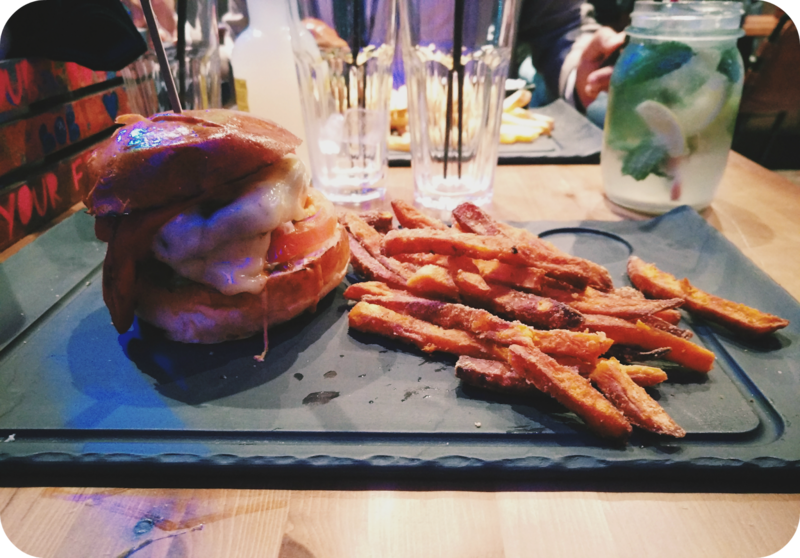 I’m not always a fan of eating on black slates for fear of my food spreading and spilling all over the place, but luckily these slates were really big. I was famished so I was pleased to see that the portion sizes were decent too. Both burgers tasted really nice and had a unique taste that was different to your usual beef burger. The voodoo chilli had a distinct lime taste which I loved. What I didn’t like however, was the bun. I’mn not sure why but it just literally fell apart so it was impossible to eat it neatly. I eat my burgers with a knife and fork (ooh, get me) and even then it was falling all over the place. It just made eating into hard work which got annoying towards the end. If I were to visit Band of burgers again I would probably ask to have the burger cooked medium-well done. The outside of the patty got a little hard and as the food got colder I wasn’t sure I was enjoying my burger much anymore. Still, that’s not really the chef’s fault as it’s what I asked for. I prefer my burger’s a little softer and juicier so if you’re the same, remember to ask for it to be cooked medium. The sides were both really nice and seriously moreish. My only other very small grumble is that I wasn’t too keen on my mojito. It was made with just lemonade and had no ginger beer in it. That’s maybe me being too fussy, but I still drank it all.